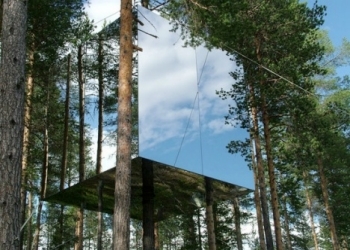 The starting point is to create a shelter up in the trees: a lightweight aluminium structure hung around a tree trunk, 4x4x4 metre boxes clad in mirrored glass. The exterior reflects the surroundings and the sky, creating a camouflaged refuge. The interior is constructed from plywood and the windows give a 360 degree view of the surroundings. 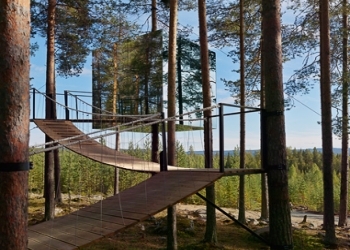 The tree hotel concept meets the increasing interest in wild life-/eco tourism where one may encounter and experience the pristine nature of Sweden. The cube provides living space for two people: a double bed, bath, a living room and roof terrace. Access to the cabin is by a rope bridge. To prevent birds colliding with the tree hotel, a infrared film, visible for birds only, will be laminated into the glass panes.